Parents often joke about providing a taxi service for their children and new figures show it’s no wonder they feel like full-time chauffeurs. 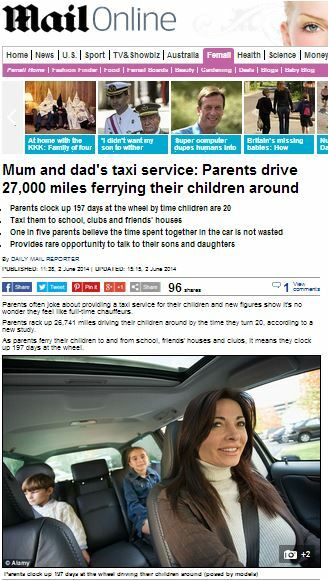 Parents rack up 26,741 miles driving their children around by the time they turn 20, according to a new study. As parents ferry their children to and from school, friends’ houses and clubs, it means they clock up 197 days at the wheel. Meanwhile, parents are sat waiting for their children in the car for 30 hours and 46 minutes a year, according to the study by Goodyear. Goodyear, of course, being the tyre manufacturer – highlighting to parents just how much driving is involved in raising a child. 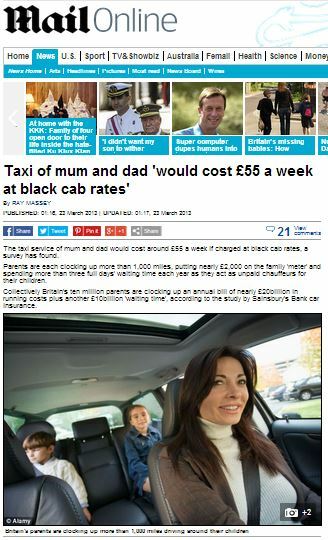 The taxi service of mum and dad would cost around £55 a week if charged at black cab rates, a survey has found. Parents are each clocking up more than 1,000 miles, putting nearly £2,000 on the family ‘meter’ and spending more than three full days’ waiting time each year as they act as unpaid chauffeurs for their children. Collectively Britain’s ten million parents are clocking up an annual bill of nearly £20billion in running costs plus another £10billion ‘waiting time’, according to the study by Sainsbury’s Bank car insurance. 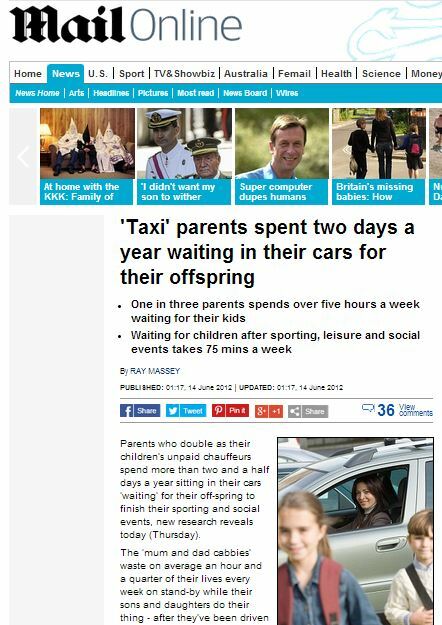 Parents who double as their children’s unpaid chauffeurs spend more than two and a half days a year sitting in their cars ‘waiting’ for their off-spring to finish their sporting and social events, new research reveals today (Thursday). The ‘mum and dad cabbies’ waste on average an hour and a quarter of their lives every week on stand-by while their sons and daughters do their thing – after they’ve been driven to their appointments, says the report by Sainsbury’s car insurance. In fact, eagle-eyed readers might recognise the poor, put-upon parent in the photos accompanying each of the three stories – given that the Mail used precisely the same set of stock photos for all three articles. 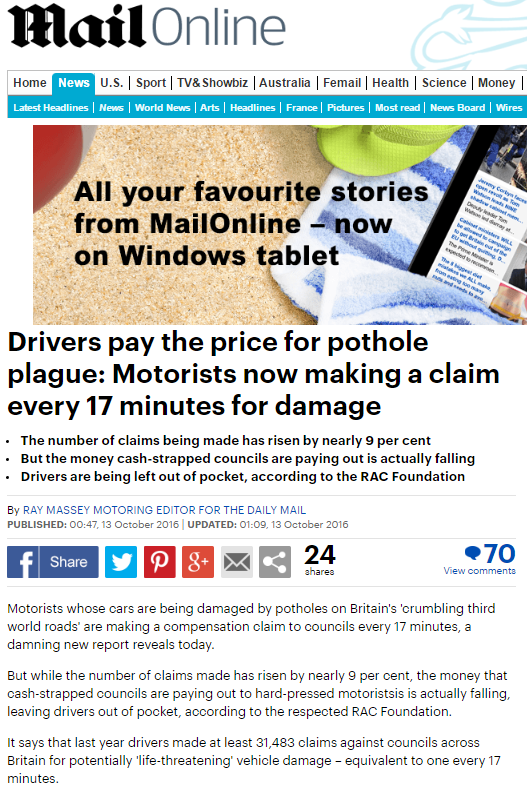 They very much seem to be the Daily Mail’s go-to stock driving family. 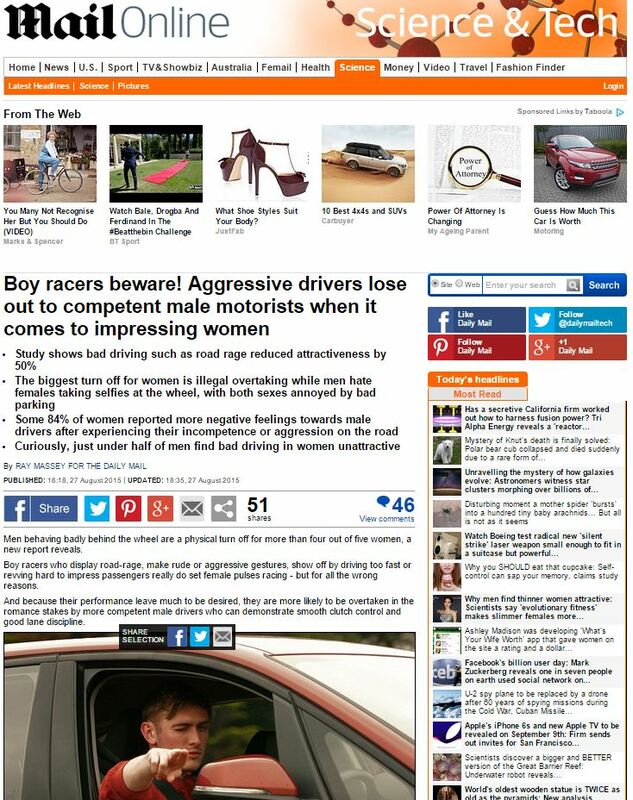 This poor lady isn’t the only stock-parent cursed to spend eternity behind the wheel, however – the same story also appeared in June 2011 on behalf of Halford’s Autocentre and even as far back as February 2008, when the AA brought it to the Mail’s attention. It’s enough to drive you to distraction. 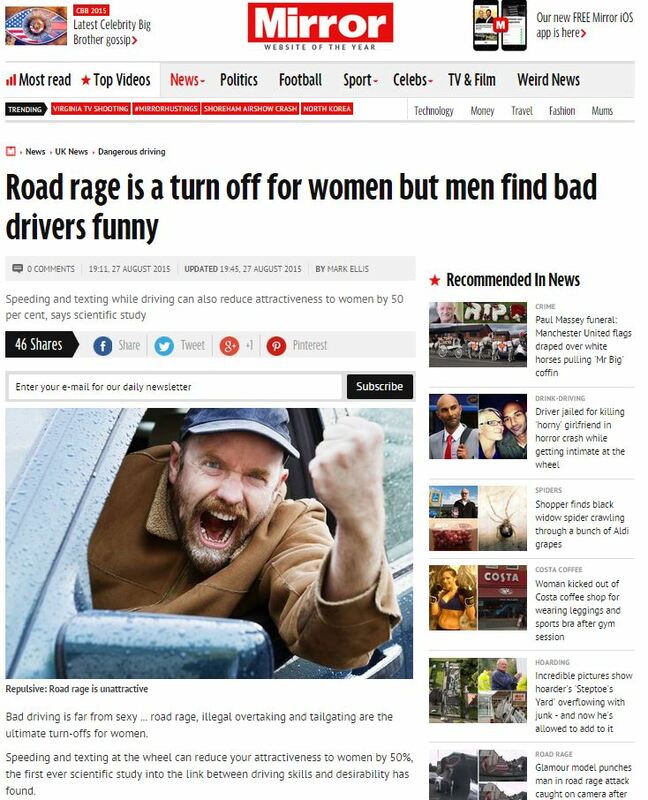 This entry was posted in Uncategorized and tagged AA, daily mail, daily mail reporter, Emily Fleming, halfords, Kate Rock, ray massey, Rory Carlin, sainsburys, Simon Douglas on June 9, 2014 by Michael Marshall. It could be the end of the garage as we know it. Half of Britain’s motorists no longer use theirs to house the car, a survey has found. Sports gear, gardening equipment and household clutter now fill many garages, with some families even converting the building into living space. A study by RAC Home Insurance concludes that nearly half – 4.6million – of Britain’s 10.6million garages are no longer being used for their original purpose. 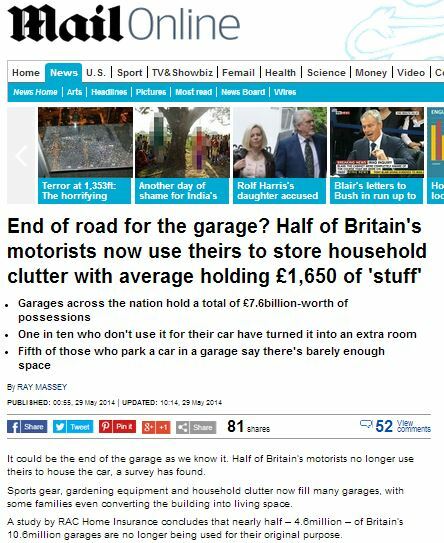 The RAC report said: ‘The death of the garage as a place to keep the car is now confirmed. ‘It’s frightening to think that nearly five million garages are not used for the purpose they were made. ‘For all those who use their garage for extra storage, security is an important issue to consider as they are relatively easy targets for thieves looking for high value items such as bikes and tools. So, garage-owners of the UK: take out RAC Home Insurance today, and perhaps finally Simon Williams will be able to set his fears to bed and sleep more easily in his converted-garage-bedroom. This entry was posted in Uncategorized and tagged daily mail, rac, ray massey, simon williams on June 3, 2014 by Michael Marshall. 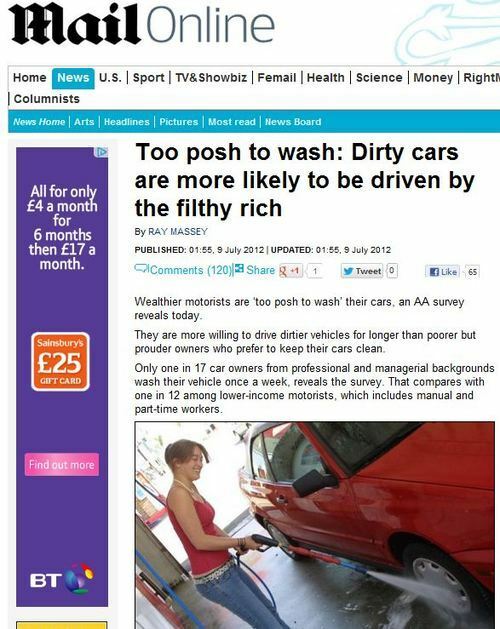 Wealthier motorists are ‘too posh to wash’ their cars, an AA survey reveals today. They are more willing to drive dirtier vehicles for longer than poorer but prouder owners who prefer to keep their cars clean. Only one in 17 car owners from professional and managerial backgrounds wash their vehicle once a week, reveals the survey. That compares with one in 12 among lower-income motorists, which includes manual and part-time workers. Overall, a grubby 3 per cent of the 18,080 AA members surveyed admitted to washing their cars just once a year or not at all. Among women drivers, this figure doubled to 6 per cent. While 18,080 represents a remarkably large sample size, it’s worth bearing in mind the self-selecting nature of the respondents – all of respondents were people who’d chosen to be members of the AA. This could throw up all sorts of biases – for example, the average higher-income driver may well be able to afford to be part of the AA, whereas the average lower-income driver may not. In effect, this would bias the survey to include a higher proportion of those lower-income drivers who prioritise car care and thus fork out for AA cover, whereas the lower-income driver who doesn’t see car care as as much of a priority will be missing from the survey – a distinction which may be lessened where the drivers have more disposable income. What’s more, the ensuing breakdown is little more than data-mining – without outlining ahead of time the questions you’re looking to answer (such as ‘do wealthier people neglect washing their cars?’), any findings from the data can’t be confidently stated, especially with the narrow margins involved. Take for example the 1 in 17 wealthier-backgrounded people who wash their car each week, compared to the 1 in 12 people of lower-income: broken down to a percentage, this is the difference between 5% and 8% – which may not pass for statistically significant. It’s certainly not enough to assert that poorer people are ‘prouder’ of their cars. Consider also – does the survey show that poorer people have cleaner cars, or that people of lower-income wash their own cars more often than those who have the disposable income to pay to have their car cleaned by someone else? Similarly, the statement ‘3% of people admitted to washing their cars just once a year’ may well show that there are unwashed cars around, or it may actually show the number of people who wouldn’t say they had ‘washed their car’ if someone else had washed it for them. Without access to the survey and the questions, we have data but no information. The survey showed that drivers in Scotland and North-East England have the cleanest cars, with 11 per cent of owners washing them every week. This compares to just 4 per cent in London and South-West England. Rather confusingly, here, the AA has changed its mind as to what the data represents – if the more well-off amongst us wash our own cars less often than the lower-income driver, would a higher incidence of car-washing in the North East show a higher proportion of cleaner cars, or a higher proportion of lower-income drivers? Again, we have data but no information. Before we go overturning any old adages, it’s probably best to analyse and understand what story we’ve uncovered. If we don’t we’re largely left with a case of Have Data, Will Mine. This entry was posted in Uncategorized and tagged daily mail, data mining, edmund king, ray massey on July 10, 2012 by Michael Marshall.